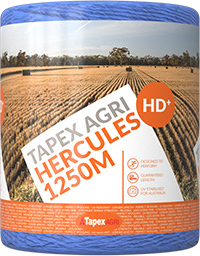 Hercules® HD+ 1250 Metre is the strongest twine in the Tama Australia range. With higher tensile strength and longer length than the standard Hercules®, this is a new generation for high density twine. Developed in Australia alongside professional contractors, the substantially higher tensile strength afforded by Hercules® HD+ allows you to maximise your payload with the added advantage of less down time through spool changes. Tapex offer guaranteed minimum length in all of our twines. Don’t get caught out with short running spools.